It just reminded me of what the original intention of the blog was,a little homage to our four legged friends.So here is the story of Kelly the Irish terrier as told by David Smith.I know,I didn’t even write me comeback blog! The story of Kelly. 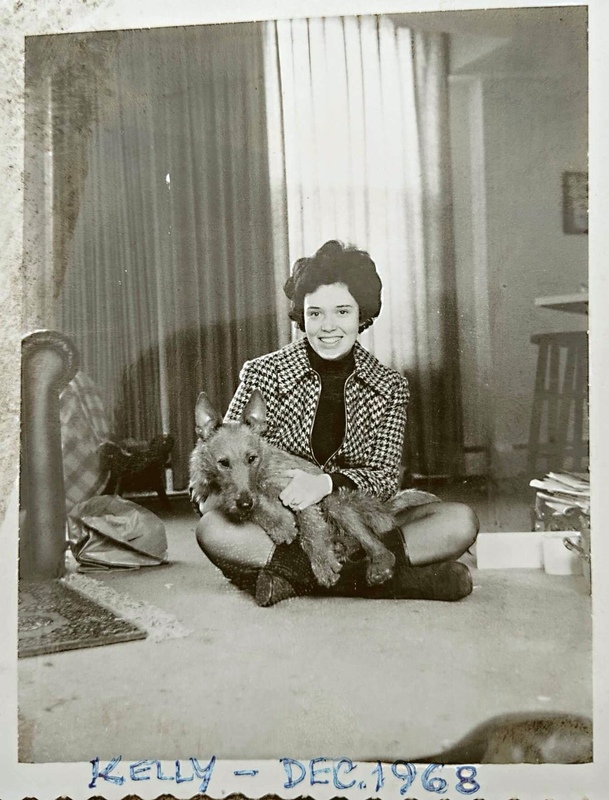 Two weeks ago, I posted that we became acquainted with Irish Terriers fifty years ago — that was 1968 — when we got our first one, Kelly, and have had one (now two) ever since. I alluded to his “story” and many of you pleaded for me to tell it. Well, you will not believe it but here goes. Shortly after we got married, we decided to go shopping for a dog and started at our local SPCA. As we browsed along the aisles, suddenly my wife exclaimed “Wow, that’s an Irish Terrier”. She is a dog aficionado and her dad had an Irish Terrier when she was a child so she recognized this one immediately. We inquired about him and the attendant said the dog was found by Animal Control in a downtown alley and he was scheduled to be EUTHANIZED the next day… yikes! So, we made up our minds on the spot and brought him home (he threw up in the car on the way). He seemed very frail, skinny, and sickly, no doubt from living on the streets. The next day we took him to a vet and we asked about immunizations. The vet said you must first give me some time to help this dog get healthy before he could tolerate any shots. He estimated the dog to be about 9 months old. We could only speculate about his history. Fortunately, our splendid vet did indeed restore Kelly to health and he went on to live with us for 13 years. These two new photos show him a few weeks after departing the SPCA and, on the right, after he realized that he’d fallen into the lap of luxury. PS: back then we were not much into photography and we have only a very few photos of him. OK so thanks to David for his kind permission to replay this story.Fifty years of love and dedication.David may have been questioning my sanity with the late evening request to borrow his story but I appreciate his permission.I just adore the pictures and think they tell there own story better than I could.Kelly was a lucky dog and if you needed some inspiration to get down your local rescue… you just got it!Fifty years of love right there. PS.If you have a dog story you would like to share feel free to get in touch!